The ongoing dispute between aerospace companies Bombardier and Boeing – which has raised fears over future of production at Bombardier’s Belfast facility – has served to highlight the highly integrated nature of modern capitalism and the exposure of the Northern Ireland economy to global upheavals. While the rivalry between Bombardier and Boeing – over Bombardier’s efforts to enter the passenger jet market with its C-Series project – has been ongoing for some time it escalated dramatically in September when the US commerce department imposed tariffs of nearly 300% on the Canadian company’s jets. This decision followed from a complaint from Boeing of unfair competition after Delta Airlines ordered 75 CS100 model aircraft from Bombardier. With the imposition of tariffs this deal was now in doubt. Moreover, the prospect of being shut out of the US market threatened the whole C-Series project and even the future of Bombardier itself given the resources committed to it. With Bombardier already struggling with the lower than expected sales of this new product and a downturn in its traditional business jet market this was a hammer blow. Bombardier not only dominates the north’s aerospace sector – the most advanced part of the northern economy – but also the wider manufacturing sector. One of the largest private companies in Northern Ireland it directly employs around 5,500 workers with thousands more employed in its supply chain industries. Bombardier accounts for around seven per cent of all manufacturing jobs in the region (almost 50 percent of the total number of manufacturing jobs in Belfast alone) and produces ten percent of north’s total manufacturing exports. Indeed, this concentration of employment and output is a feature of the local manufacturing sector with just one percent of companies accounting for half of that work in manufacturing and forty nine percent of turnover. This makes it highly vulnerable to downturns not only in the global economy but also within particular sectors (such as aerospace) and even individual companies. The dispute over the C-Series took another dramatic turn in October when Bombardier announced a co-operation agreement with the European aerospace consortium Airbus. Under its terms the Airbus Group will take a controlling interest in a joint venture to produce the C-Series project. Airbus has also been given an option of taking complete control of the venture by buying out the other shareholders (Bombardier and the government of Quebec) at a later date. The critical element of this deal is that final assembly of the C-Series jet will be moved from the Bombardier plant in Quebec to the Airbus facility in Mobile, Alabama. It is assumed that this location will make the US penalties obsolete. There is also another benefit to this site that has gotten little attention in the fanfare surrounding the deal and that is the fact that it is non-union plant. This is facilitated by Alabama being a so-called “right to work” state where draconian labour laws make it very difficult for to unions to establish a presence within companies. With the Bombardier/Airbus agreement on the C-Series project there is an assumption that the threat to the Belfast facility has receded. However, this is not the case at all. As it stands the tariffs are still in place and the C-Series remains effectively blocked from the US market. The belief that the transfer of production to a facility within the US will subvert any attempt to impose tariffs is uncertain. In a recent statement on the dispute by the US Commerce secretary about “adjusting” its tariff regime was ambiguous and could actually signal a closing of the loophole that Bombardier/Airbus hope to take advantage of. This will be known when the Department makes its final ruling nest February. Even if the tariffs are lifted the entry of the C-Series into the US market will be further delayed. Since the Airbus-Bombardier C Series deal isn’t expected to close until the second half of 2018, it could be 2019 or 2020 before Delta sees its first planes. There is no guarantee that the C-Series, even with the backing of Airbus, will be a commercial success. The opening of a low cost facility in the US, which is the centre piece of the C-Series deal, will bring even greater pressure upon the workers in Belfast. Those who see this deal as a saviour are therefore likely to be disappointed. The disputes within the aerospace industry are but one example of the increasing tensions between states and the accelerating drive towards a full blown trade war. The most blatant manifestation of this the “America First” programme of the Trump administration, which seeks to halt the accelerating decline of US global economic power through protectionism and economic nationalism. We also see it in Brexit and the increasingly acrimonious negotiations over Britain’s future relationship with the EU. At this stage it is largely economic power that is being applied but we know from history that military force often follows. The US threats to North Korea – which are really aimed at its principal economic rival China – show the real possibility of major wars breaking out in the near future. 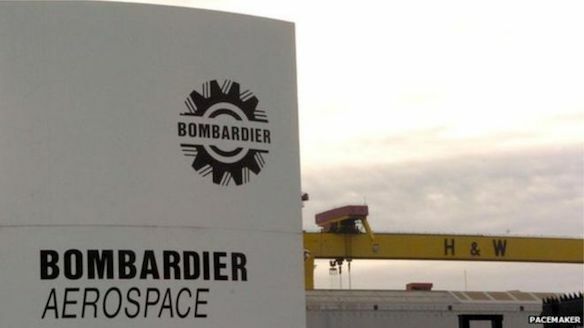 What has marked the trade union response to concerns over the future of the Bombardier plant in Belfast has been the complete absence of a class perspective. Despite being organisations that claim to represent workers, Unite (whose members are most immediately affected) and the broader trade union movement in the form of ICTU, have not put forward proposals that identify or defend the distinct interests of workers. By denying that there are any class divisions they subordinate workers completely to the demands of companies; to the interests of the capitalist class within a region or nation; and to development strategies of various layers of government. Within this framework – where the overriding imperatives are the maximization of profitability and the creation of a favourable environment for capital investment – all the working class can do is to make the sacrifices that are demanded. This is essentially the social partnership model. While it may not be as formalised (compared to the south) it still underpins the approach of unions within the northern state. This has been the case for some time, particularly in the most recent period of Stormont rule when trade unions facilitated various “reforms” of public services. It was made very explicit by ICTU’s endorsement of the programme of austerity contained within the Fresh Start Agreement of 2015. The whole thrust of this was the demand that workers make sacrifices to preserve the political institutions. For the trade union leadership their role is not to be an opposition (a scenario described by ICTU as “catastrophic”) but to be an assisting partner. This approach is not confined to the state sector. Where trade unions have a presence within the private sector, such as in manufacturing, they have played the same role. When Bombardier announced its global restructuring plans in 2016, which included hundreds of job losses at its Belfast plant, the response of trade union was to offer assistance in managing the reductions. This followed on from the previous year when Unite balloted its members on proposals for a pay cut. These proposals were overwhelming rejected despite there being no direction from the leadership. Alongside collaboration with management the trade union approach also involved appeals to government. Peter Bunting, assistant general secretary of the Irish Congress of Trade Unions declared that Northern Ireland “urgently needs a comprehensive and ambitious manufacturing strategy”. Unite called on the Executive to “redouble their efforts and secure alternative employment for those highly skilled workers who will be made redundant” and for Invest NI [the inward investment agency] to “commit themselves fully to pro-actively seeking foreign investment in manufacturing.” This is despite the fact that Bombardier had already received £75 million of state assistance between 2002 and 2015. The latest crisis surrounding Bombardier has seen the same campaign rolled out again. Coming against the backdrop of escalating trade disputes and the collapse of the political institutions in the north it has taken on an even more desperate and reactionary character. Under the banner of #BackBomabardier (so completely identifying with the company) the Unite led campaign has consisted largely of lobbying various layers of government. Despite the absence of a Stormont Executive there have been appeals to the DUP and Sinn Fein to support Bombardier – the DUP through its influence with the Conservative government at Westminster and Sinn Fein through its political contacts in the US. The close economic relations between Britain and the US, added to the desperation of the British government to make post-Brexit trade deals, makes such a scenario unlikely. But even it were a realistic prospect the consequences would be thoroughly reactionary with workers being lined up with their employers and their governments against workers in other states. It is also reactionary in the sense that it ignores the reality of an integrated global economy in which production is spread over many countries. The aerospace industry is a prime example of this trend. In all the talk about protecting jobs in wasn’t mentioned that Boeing actually employs more people in Britain than Bombardier does. Despite this Unite were calling for a review of procurement contracts that would have put the jobs of those workers (many of them union members) under direct threat! This is a ridiculous scenario but it is one that follows from trade unions pandering to economic nationalism. Other aspects of this have been the endorsement by some in British trade union leadership of job reservation (“British jobs for British workers) and restrictions on labour migration. Pleas for the “peace process” are the default position for the trade unions on nearly every issue. For example, many of the current ills in society are being put down to the absence of an Executive. But what is the evidence that its restoration would bring any remedies? The problems in public services were there before its collapse. Moreover, its record on delivering social improvements during its previous seven years of existence was poor. With the adoption of an austerity programme (one endorsed the trade unions) that will run for the foreseeable future the potential for of the Executive in this area is even less. But even if resources were not an issue and the political institutions were restored they could still not deliver any progress. This was not their purpose. Rather they were about managing sectarian and distributing patronage – a system that ultimately proved to be unsustainable. The proposition that there is a link between unemployment and the activities of “dissidents and paramilitaries” is also dubious. It is also quite dishonest. The reference to “paramilitaries” obviously refers to loyalists. Yet over the period of the peace process these groups – rather than going away – have become even more entrenched in working class communities. Indeed, it is loyalists who have been some of the main beneficiaries of the patronage mentioned above. Shamefully, trade unions through their role in the community sector, have helped to legitimise this process. This is consistent with the historic role trade union movement in the north of presenting itself as even-handed while at the same time accommodating to loyalism and unionism. What the trade union statements around Bombardier do point towards – though not explicitly – is the absence of an economic peace dividend for the north. Though there has been an expansion of the economy has not been of the order expected in the wake of the Agreement. It is also the case that most of the growth that has taken place has been the result of additional public spending rather that investment by private capital. Another trend is that within the private sector high wage high skill manufacturing jobs are being displaced by low wage call centre/retail type jobs. We see this in the recent complete shutdown of the Michelin and JTI Gallagher facilities and the ongoing redundancies at Bombardier, Caterpillar and the oil field services firm Schlumberger. Overall, the Northern Ireland economy remains (almost twenty years into the peace process) one marked by low wages and state dependency. The potential impact of Brexit could depress the northern economy even further. Any hard border scenario – in which the north is removed from the customs union and single market – would cause huge disruption to north south trade and investment. Indeed, a number of high profile companies based in the north are already making contingency plans to move production. In a development directly related to Bombardier the UK head of Airbus recently told a parliamentary committee that it would consider moving its wings design facilities (described as the “crown jewels” of manufacturing) if products were subject to tariffs. This was taken to be a reference to its plant in Wales, but given that Airbus has now taken a controlling state in the C-Series it could also apply to the Bombardier plant in Belfast. What is needed in response to the threats to jobs at Bombardier is a workers campaign that puts the class interest to the fore. This would be in complete contrast to the current campaign that denies the class issues and seeks to line up workers behind their “own” employers and governments. Such a campaign – which it is subordinated to forces that are hostile to labour – can only end in defeat. The only reliable allies of workers at Bombardier in Belfast are other workers – whether that be in Bombardier facilities elsewhere or in other companies (such as Airbus and Boeing) across the aerospace sector. This points to the need for a co-ordinated campaign of action that organises workers across corporate and national boundaries. It is only through such a class based and international approach that attempts to play workers off against each other in a race to the bottom can be effectively countered. At present this does not exist but the first essential step towards it is the recognition there is a working class interest. For socialists and trade union activists the task is to promote working class independence at every level.